There are so many delicious things you can make with frozen bread dough. 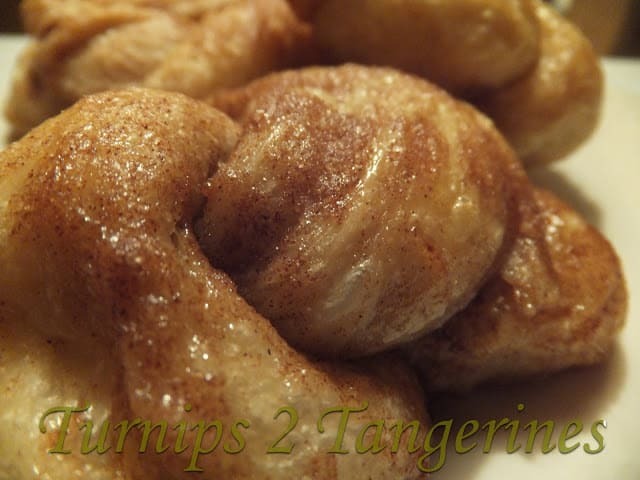 More specifically, these cinnamon knots. 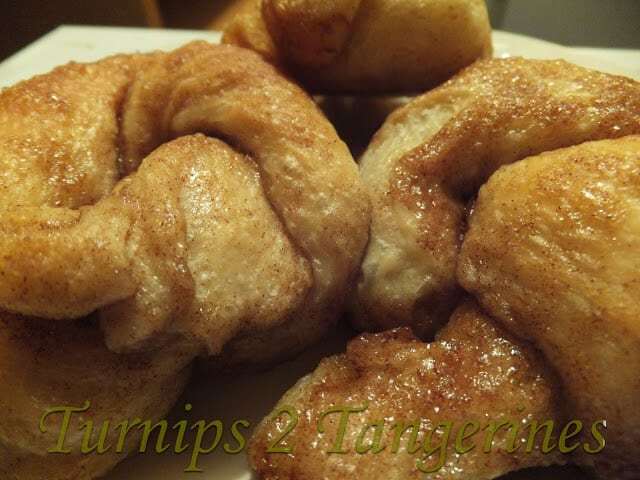 We found this recipe for cinnamon knots on the back of a package of frozen bread dough. You can find the best recipes on the back of boxes, packages and the like. You can make many wonderful things with frozen bread dough. The perfect reason why you need to keep frozen bread dough in your freezer. I always have frozen bread dough in my freezer. Rhodes bread dough is a brand that I’ve using for many years. You can still buy a package of frozen bread dough, 4 loaves of frozen bread dough per package, for under $5.00. The list of delicious things you can make with frozen bread dough is a long one. From garlic bread to monkey bread to orange knots, anything is made possible using frozen bread dough. Here are a few recipes using frozen bread dough. Each recipe is delicious and personally taste tested by me:) Garlic Herb Bubble Bread, Easy Monkey Bread, Pepperoni Pizza Bread and Reuben Braid. All of the recipes are super delicious and are favorite with family and friends. Frozen bread dough works beautifully in this recipe. Cut loaf into 12 equal pieces. Mix together cinnamon and sugar. Roll each piece of dough into a 9-inch rope. 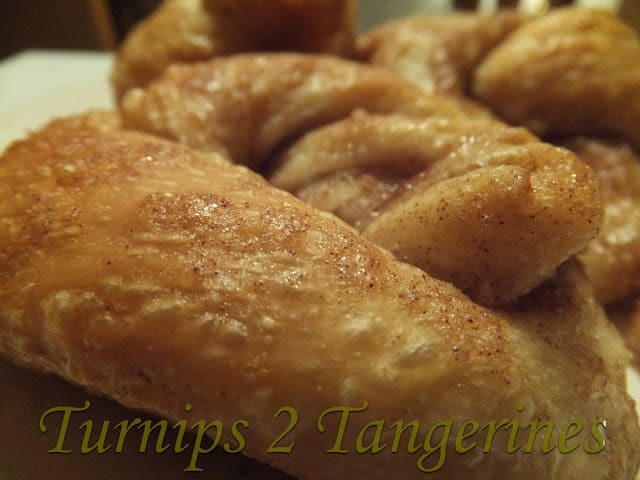 Dip each rope into melted butter and then roll in the cinnamon sugar mixture. Tie in a loose knot and place on a baking sheet coated with non-stick cooking spray. Cover with plastic wrap and let double in size. Remove wrap and bake at 350º for 20 to 30 minutes. Cool on wire rack. Combine glaze ingredients and brush over warm knots. These look great! Quick and easy too! that looks great! Thank you for stopping y and following my blog. I am following you google + and GF. Have a lovely weekend! Thanks for stopping by and following me Sara! I think this is a fabulous idea…thank goodness for those things that hide from us in our freezers right. Haha. I saw your link up at Fun Friday and I wanted to come check out your blog and follow. If you would like to follow me you can find me at http://onecreativeprocrastinatinggal.blogspot.com/ Oh and I just started having a new blog hop "Inspiration in Progress" and this is one of those inspiring things….if you would like to link up it is still going on and I would love to have you. Hi! Just stopping by from the FTF blog hop! New follower on your lovely blog, would love to have you stop by my blog sometime and follow back if you like. These look yummy!